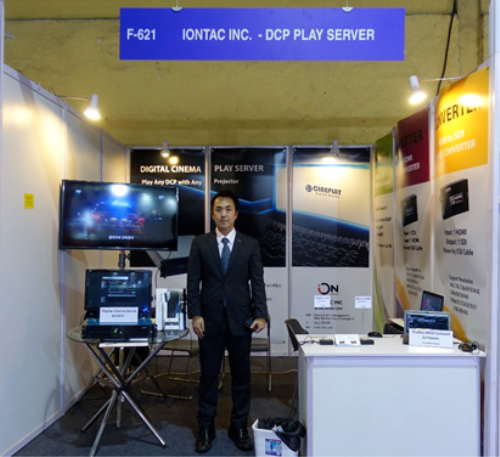 Mumbai based Envoy presents high quality IONTAC Digital Cinema Play Server -DCP Server- CinePlay S1, South Korea’s main choice for high quality DCI compliant DCP playout of Hollywood movies. Envoy will target the approximately 2000 independent screens transitioning to DCI compliant standard from their existing E-Cinema sub-standard digital projection. DCI standard implies a 2K projection system to ensure high quality. ENVOY introduces South Korean proven technology - High-end Real time decoding of 2K@24fps play of encrypted DCP at Playback rates of 250Mbps. Also XYZ to RGB colour conversion. Based out of Mumbai’s Bollywood district – Juhu, Santacruz - Envoy is established since 1985, delivering solutions in pro audio and digital media production till 2008. Its history of technology transfer in the optical media industry led to DVD mastering and replication facilities. IONTAC CinePlay S1 supports any DCI compliant projector. ION-CP4K-S1 is perfectly compatible with DCI 1.2.Capable of playing JPEG2000 digital movies (DCP-Digital Cinema Packages). 2L flat cinemascope. 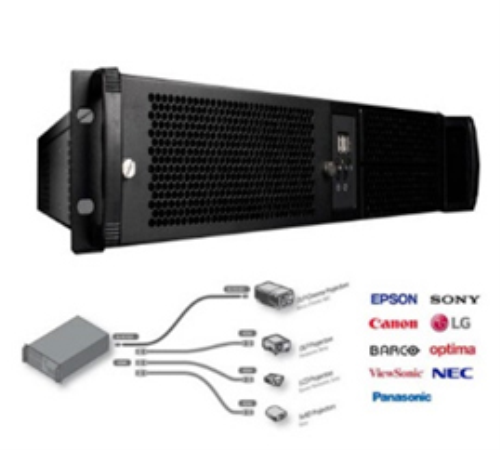 Video output resolution-HD,2K,4K @ 24p, 25p, 30p, 50i, 60i. Solutions for digital cinema include CineStor – CineStor is a central storage server for the S1 Cinema Server. CineMaster- The CineMaster server is a Windows / Linux 64bit E5 Xeon server optimized for easyDCP. easyDCP Creator family is available from IONTAC-Envoy. 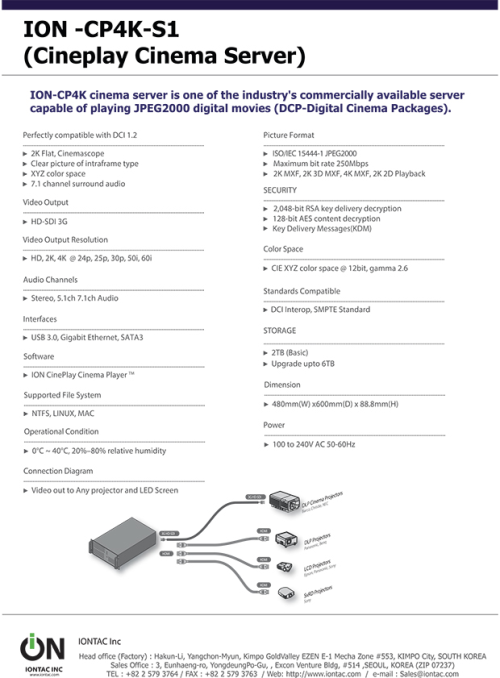 The final step in Motion Picture Production for digital cinema production is the production of DCP (Digital Cinema Package) for digital cinema screening. easyDCP Creator provides an intuitive interface for DCP creation and can easily create DCP compliant DCP Master. easyDCP Player – easyDCP Player is used to play JPEG2000 encoded DCP file and also used to export DCP to Quicktime Mov or Sequence file (J2c, Tiff, DPX). The powerful export function of easyDCP Player outputs video files and audio files that can output to Quick Time Mov using Sequence file or various codecs. easyDCP KDM Generator – easyDCP KDM Generator provides the ability to create and distribute a key for decryption to an encrypted digital movie DCP for security. Movie subtitle creation software – Subtitles to be screened at the theatre use CinemaXML subtitlesfile and are packed together with DCP. EZTitle is compatible with all CineCanvas and Overlay methods of subtitles used in digital movies and is compatible with all the Cinema Server Projectors. IONTAC CinePlay S1 allows to play any DCP with any projector. That is the key to a neutral market. The CinePlay S1 is a growth impetus for cinema theatres at a time when the movie industry needs a neutrality and transparency. 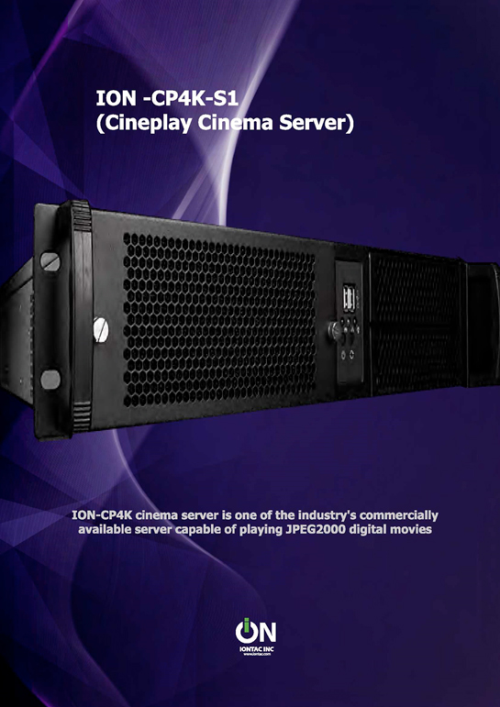 More Envoy News: May 29, 2018 ENVOY Launches IONTAC Digital Cinema Package (DCP) Server to upgrade multiplex screen quality in India.